The Forerunner Lifesupport Pod deactivated (left) and garrisoned by ODSTs (right). The Forerunner Lifesupport Pod is a Forerunner structure located in Beasley's Plateau, Arcadia, in close proximity to the Arcadia ONI facility and Forerunner ruins. As of 2531, the structure was controlled by an unidentified insurrectionist group operating on Arcadia. The structure is an anti-gravity tower, composed of a square platform suspended in the air when activated, with protective walls occupying each corner of the platform, thereby blocking access between the platform's edges. When deactivated, the platform rests on the square base underneath, with the walls rotated and holstered under the platform. 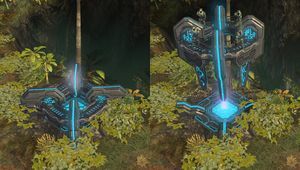 The Forerunner Lifesupport Pod appears exclusively in the Halo Wars Skirmish level Beasley's Plateau. Like Forerunner Supply Elevators on Blood Gulch, it is defended by a large amount of Rebel Infantry units rather than Aggressor Sentinels, despite its Forerunner nature. Units garrisoned in the Lifesupport Pod receive the same defensive bonus as they would in a deployable lookout tower. When garrisoned, the Lifesupport Pod provides an additional ten unit population increase bonus to the Covenant and UNSC forces. This bonus raises the maximum UNSC population to 50 if they have the population upgrade, Reinforcements. The maximum Covenant population rise to 60 if the player has researched the Followers upgrade, allowing Covenant players to support up to three Scarabs. A render of the Lifesupport Pod.